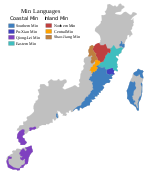 Xianyou dialect (Pu-Xian Min: Sing-iú-uā / 仙游話) is a dialect of Pu-Xian Min Chinese spoken in Xianyou, Putian in the southeast coast of Fujian province. Xianyou dialect has 15 initials, 45 rimes and 7 tones. Xianyou dialect has extremely extensive tone sandhi rules: in an utterance, only the last syllable pronounced is not affected by the rules. ^ Hammarström, Harald; Forkel, Robert; Haspelmath, Martin, eds. (2017). "Xianyou". Glottolog 3.0. Jena, Germany: Max Planck Institute for the Science of Human History. Compilation Commission of Chorography of Xianyou County 仙游县地方志编纂委员会 (1995). Xian you xian zhi 仙游县志 ["Chorography of Xianyou County"]. 34. Beijing: Fangzhi chubanshe 方志出版社 ["Chorography Press"]. ISBN 7-80122-007-2. This page was last edited on 8 October 2018, at 21:44 (UTC).